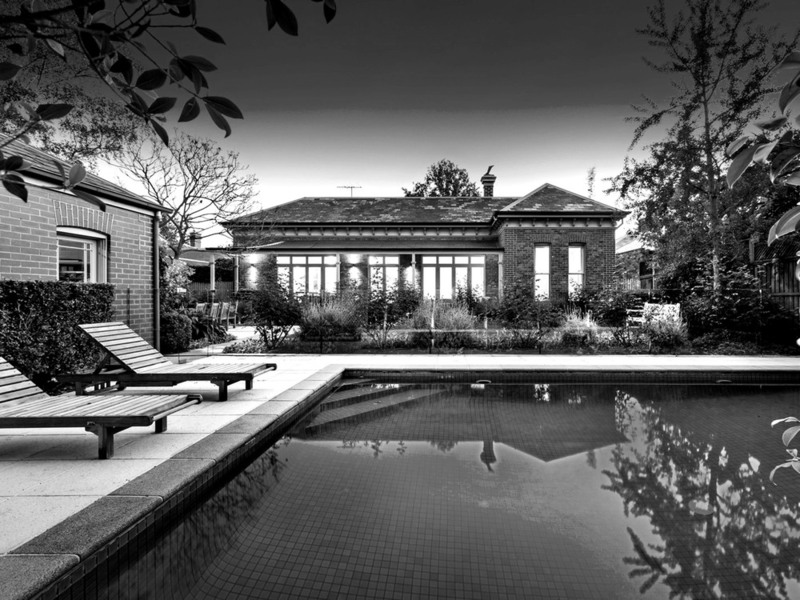 INTERIOR RENOVATION OF A HERITAGE OVERLAY LATE 1800’S FEDERATION PERIOD SINGLE STOREY HOUSE. THE ORIGINAL CLIENT’S BRIEF TO US WHEN WE FIRST MET OUR CLIENTS WAS MAINLY TO GIVE A NEW FRESH LOOK FOLLOWING THEM GETTING HOLD OF THE PROPERTY AS PART OF THEIR DOWNSIZING EXERCISE. THE EXISTING INTERIOR WHEN OUR CLIENTS BOUGHT THE PROPERTY WAS DECORATED/STYLED ACCORDING TO THE STYLE OF THE ERA, SUCH AS THE WINDOW TREATMENTS THROUGH OUT THE HOUSE WERE HEAVY DRAPES WITH PADDED PELMETS WHICH COVERED ALMOST HALF OF THEIR NARROW TALL ORIGINAL WINDOWS WHICH DARKENED THE ROOMS. 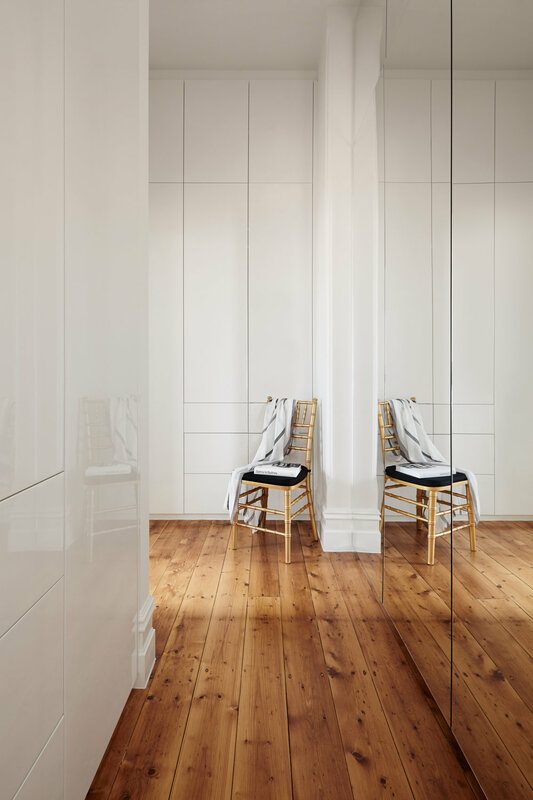 THE EXISTING BATHROOMS AND KITCHEN CABINETS WERE DESIGNED IN A MORE TRADITIONAL STYLE, THE FRONTS OF THESE CABINETS WERE LACQUERED PANELLED WITH SMALL CHROME FURNITURE DOOR KNOBS TO THE BATHROOM CUPBOARDS. THE BATHROOM’S WALLS WERE TILED UP TO ABOUT 1100MM HIGH THEN THEY WERE PAINTED PLASTERBOARD ABOVE THE TILES. THE BATH IN THE EN-SUITE WAS BUILT-IN WITH CREAM COLOURED TILE SURROUND. THE VANITY BENCH TOP WAS A “PEACH” COLOURED STONE. OTHER THAN THE EXISTING JOINERY LOOKED A LITTLE TIRED, OUR CLIENTS ALSO WANTED TO PUT THEIR SIGNATURE IN THEIR NEW HOME, WHICH IN THIS CASE THEY CAME TO US TO RENOVATE THE INTERIOR. 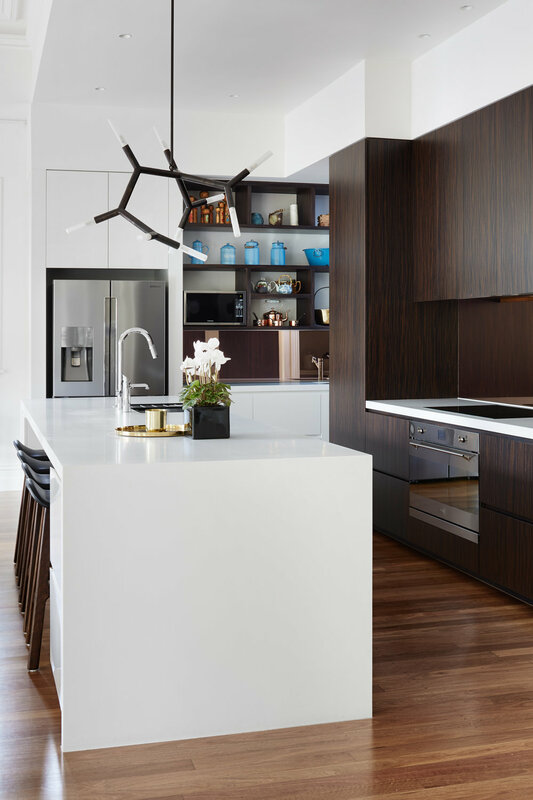 THE ORIGINAL PLANS WERE MAINLY TO UPDATE THE FRONTS OF THESE CABINETRY AS OUR CLIENTS HAD ONLY 120 DAYS FOR THE WHOLE RENOVATION PROCESS BEFORE THEY HAD TO MOVE IN. THE BRIEF THEN EVOLVED DURING THE DESIGN STAGE, AND THEY WANTED TO START EVERYTHING FROM A FRESH BLANK CANVAS. 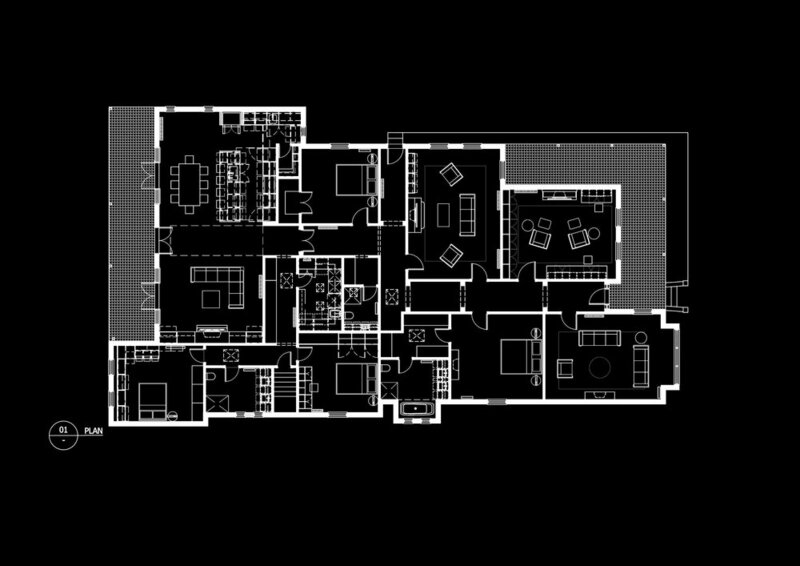 THERE WERE 3 BATHROOMS, 4 BEDROOMS, AN OPEN PLAN LIVING-DINING-KITCHEN, A FORMAL LIVING ROOM, A STUDY ROOM AND A READING/TV ROOM THAT WE HAD TO DESIGN, AND DOCUMENT INCLUDING THE BUILDERS TO MANUFACTURE AND CONSTRUCT ALL THE NEW CABINETRY FOR ALL THE BATHROOMS, INCLUDING OTHER ROOMS AND KITCHEN WITHIN THE GIVEN TIME. THANKS TO OUR CLIENTS THAT THEY UNDERSTOOD THE DESIGN PROCESS AND ONCE THEY HAVE MADE A DECISION, THEY WOULD THEN STICK WITH IT THROUGH OUT THE PROCESS WHICH MAKES THE EXERCISE GO QUITE SMOOTHLY AND QUICKLY AND THEY WERE AWARE WITH THE NARROW TIME FRAME. THE BRIEF FOR THE MATERIALS AND FINISHES, IN THIS CASE PARTICULARLY AS THEY TRAVEL A LOT AND HAVE SEEN A LOT OF BATHROOMS IN HOTELS, THEY SPECIFICALLY ASKED NOT TO HAVE A “HOTEL” LIKE BATHROOM. THE NARROW ‘L” SHAPED WALK-IN WARDROBE IN THE MASTER BEDROOM WAS THE LINK TO THE ENSUITE. AS THIS WALK-IN WARDROBE WAS LOCATED IN THE CENTRE BETWEEN THE BEDROOM AND ENSUITE WHERE THERE WASN’T ANY DIRECT NATURAL LIGHT, IT FEELS NARROWER THAN IT ACTUALLY IS. WE HAVE CHOSEN A NATURAL WHITE COLOUR FOR THE WALK-IN WARDROBE FRONTS ON ONE SIDE AND FULL HEIGHT MIRROR FRONTS ON THE OPPOSITE SIDE TO CREATE LARGER, OPEN FEELING AND ALSO BRIGHTENED THE SPACE AS THE NATURAL LIGHT PENETRATES THROUGH THE DOOR FROM THE EN-SUITE AND BOUNCES BACK OFF THE MIRRORS. THE EN-SUITE WALLS WERE TILED UP TO THE CEILING WITH A NEUTRAL COLOURED PORCELAIN AND DARK ON THE FLOOR TO CREATE AN AMBIENCE RATHER THAN TOO STERILE AS OUR CLIENTS ENJOY SPENDING TIME ON THE BATH REGULARLY. THE BEVELLED SMOKED GLASS MOSAIC SPLASHBACK AND THE NEW YORK MARBLE BENCH TOP GIVE RICHNESS AND LUXURY TO THE EN-SUITE. THE VANITY CABINETS WERE LINED WITH A RE-TONED TIMBER VENEER COLLECTION CALLED SIENA WHICH HAS A COMBINATION “MILK” AND “DARK” CHOCOLATE TIMBER GRAINS RUNNING VERTICALLY. THIS TIMBER VENEER WAS ALSO ADOPTED FOR THE NEW KITCHEN CABINETS TO CREATE SEAMLESS AND UNIFORMITY THROUGH OUT THE RENOVATED INTERIORS. THE BRONZE MIRROR SPLASHBACK PROVIDE WARM REFLECTIONS OF THE SWIMMING POOL AND TRIMMED REAR LANDSCAPE WHILE CREATING SOMETHING SCRUMPTIOUS OVER THE INDUCTION COOKTOP. WE ALSO INTRODUCED A LOW MAINTENANCE SOLID SURFACE MATERIAL CORIAN AS THE KITCHEN BENCH TOP, AS THE CLIENTS LIKE TO SPEND A LOT OF TIME COOKING. 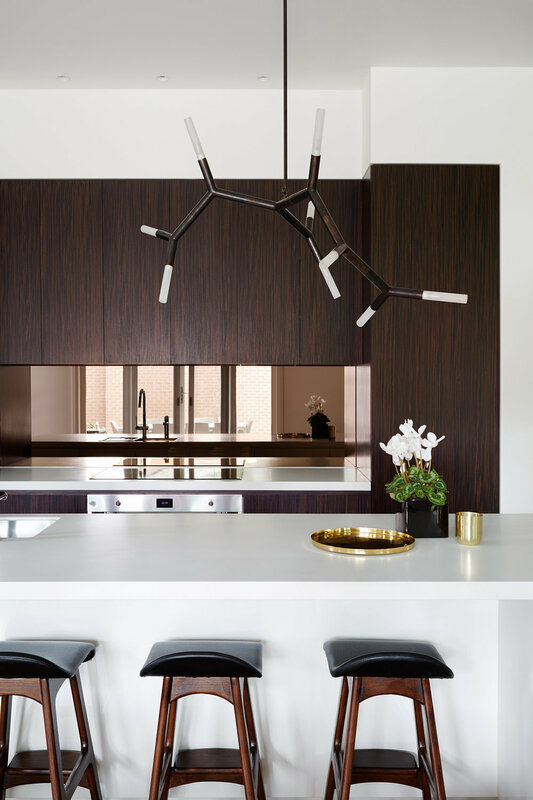 THE SCULPTURE LIKE 9 ARMS LED BRANCH CHAIN AMINO ACIDS (BCAA) PENDANT BY CHRISTOPHER BOOTS IN DARK BRONZE IS HUNG OFFSET ABOVE THE KITCHEN ISLAND BENCH TO SCALE DOWN THE SPACE AS THE CEILING HEIGHT IS REACHING 4 METERS. 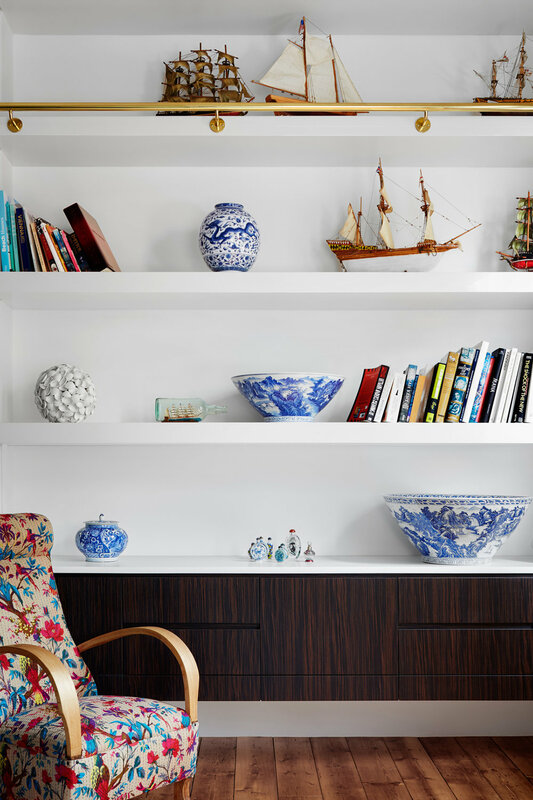 THE FRONT ROOM OF THE HOUSE IS NOW USED AS A STUDY ROOM/OFFICE AND HAS FLOOR TO CEILING LIBRARY SHELVES TO ACCOMMODATE THE CLIENT’S BOOK COLLECTIONS AS WELL AS HIS MINIATURE COLLECTIONS FROM MANY YEARS AGO INCLUDING MINI SPORT CARS AND THEIR ORIGINAL PACKAGING. OVERALL, THE RENOVATION PROCESS WENT VERY SMOOTHLY AS EVERYONE WAS COLLABORATING (INCLUDING OUR CLIENTS) TO ACHIEVE A GOOD OUT COME AND OUR CLIENTS MOVED IN TWO WEEKS AFTER 120 DAYS FROM WHEN WE STARTED THE PROCESS.